They say a picture is worth a thousand words and if you’ve been a Boise State football fan over the last decade, one photo from 2010 might strike your memory. On the eve of Boise State’s game against the University of Nevada 6 On Your Side decided to take a walk down memory lane. On November 26th, 2018 Boise State faced Nevada at their home turf in Reno. At this time, the Broncos were riding an all-time high their football program ranked fourth in the country with a chance at a national championship bid, but all that came to abrupt halt when Boise State lost their game to Nevada because they were unable to make just two field goals. Sadly the loss wasn't even the worst part. 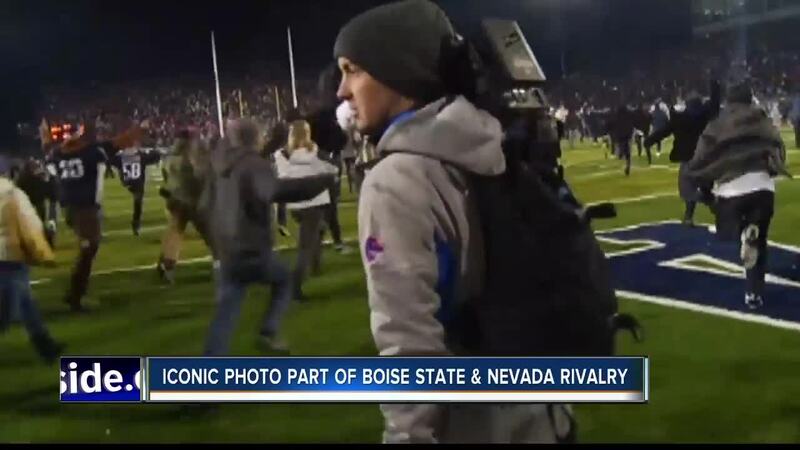 When the game ended, Nevada fans stampeded the field and some began harassing the Broncos-leading to an iconic photo that clearly depicts a Bronco/Wolfpack rivalry. Joe Jaszeski, the man responsible for catching this photo says the aftermath of this game was unlike anything he’d ever seen, "there was no security, there was not really anything to shield anybody who was on the field…many of them did come up to Boise State Players and get in their face and say things that I couldn't repeat”. There’s no one who will know what it feels like to be yelled at by an opposing teams fan more than Billy Winn, the Boise State football alum pictured above. After a treacherous game against Nevada players were exhausted, "I was down on the ground right there, yeah I was upset but even more than that I didn't have any energy to even stand up”, says Billy Winn. Even after years of playing in the NFL as a defensive end, that moment still sticks with him and it’s because of this encounter he has one thing for the Broncos, "you know take a look at that picture, you don't wanna be that guy you know kneeling down on the ground with that fan standing over you, it's the worst feeling”. Billy Winn a Nevada native and BSU alum went on to play in the NFL and after an injury in 2017, Winn became a free agent. While he’s contemplating returning to the NFL, his plans for after include coaching kids. Boise State will face the University of Nevada Saturday, October 13th at 8:30 p.m.